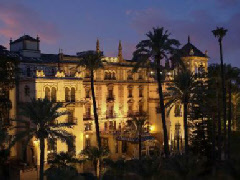 Commissioned by King Alfonso XIII himself, it was designed to rival any other hotel in Europe for luxury. Today, Hotel Alfonso XIII remains a prestigious place to stay - unsurprising given that it was created specifically to house Heads of State attending the 1929 Great Ibero-American Exhibition. Of course, given that the building dates only from the early 20th century (and is thus one of the “youngest” hotels to be found on Nights in the Past), the famous figures to have rested here are of a more recent nature. That said, in addition to numerous monarchs one will find the names of Orson Welles, Eva Peron, Audrey Hepburn, and Ernest Hemingway in its metaphorical guest book. The Alfonso XIII is five-star rated, and offers over 150 guest rooms and suites.